We work exclusively with two framers here in the UK for our pet portraits. We have especially selected each framer to work with us as they each, not only provide specialised services to cover all of our framing needs, but they are also the highest quality framers here in the UK. All of our frames are made in the UK from sustained wood sources and hand crafted by artisans. Each framer provides us with quality, hand crafted bespoke frames for both our pencil drawings and oil paintings. We have an ever evolving selection of mouldings, styles and finishes so we always have plenty of choice for all of our pet portrait clients. 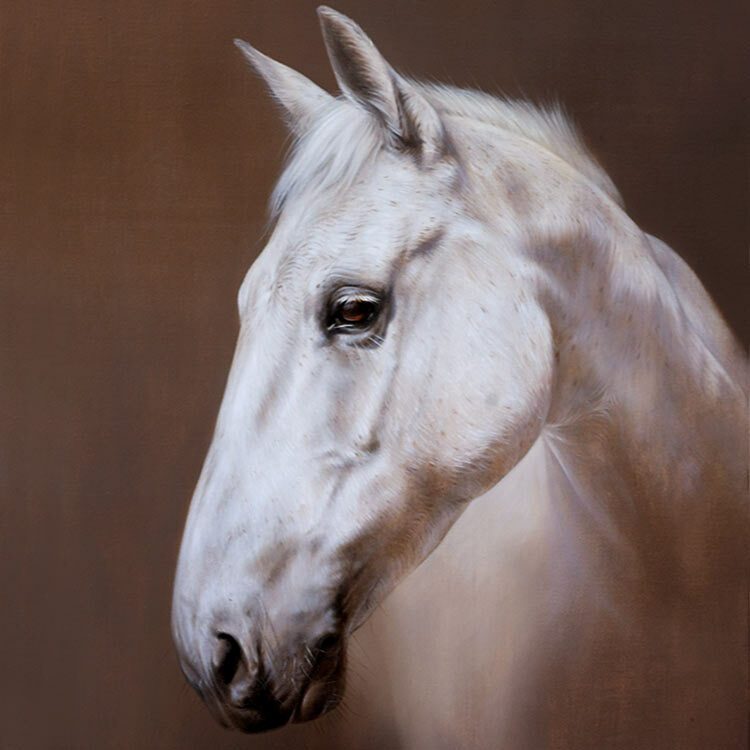 Our oil painting and pencil drawing galleries show some of our recent artwork framed so please feel free to look around and see if any of the styles and frames might work for you too. If you are looking for something specific, just let us know your ideas and we can find something perfect for you and your home decor. Drop us a line at any time from our pet portraits contact page. I would like my portrait framed - how does it work? When clients commission an oil painting or pencil drawing, once the design of the portrait is arranged we then chat about framing. We are always happy for clients to use their own local framers, however some clients like to have us complete everything for them. This means that when the artwork arrives they can either display it on their wall straight away or wrap it ready to give as a gift to friends and family. We have so much choice that it is often good to give us an idea of the kind of frames you are looking for. Everyone is unique, everyone has different home décors - whether it is simple contemporary whites and grey colours, or lavish golds with lots of decorative details. If you would like us to match a frame, or find something similar clients often send photos of other paintings they have in their homes for us to see. This is extremely helpful and we can then send over a range of ideas to choose from. 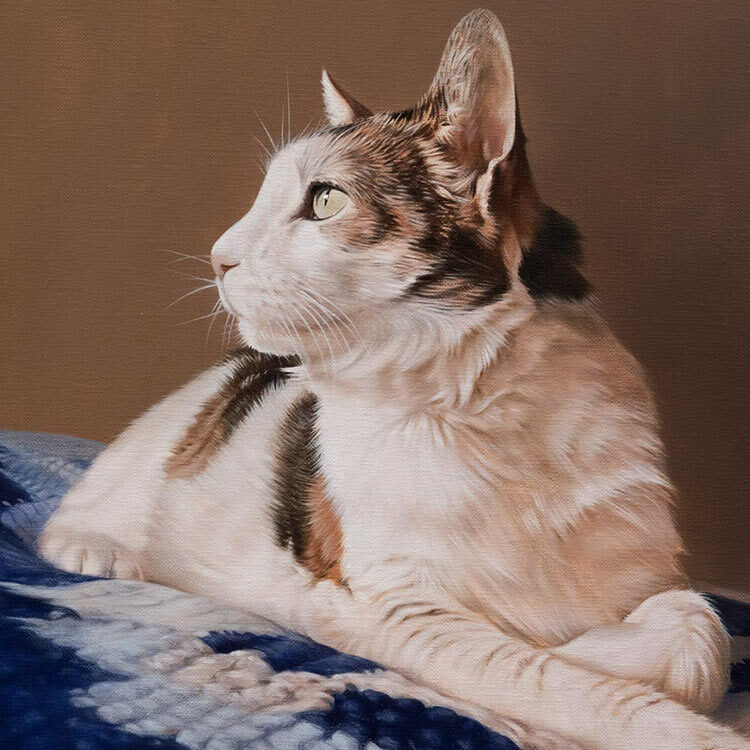 Our Pet Portraits Framing Gallery is a great place to start as it shows many of the amazing frames we have commissioned our framers to make and you can see photos of them with our artwork too. This can help you to visualise what you portrait could look like framed. How much does Pet Portraits framing cost? Once you have an idea of the frames that you like, we can get individual quotes for you from our framers. All frames are made bespoke for our portraits and so every frame will be a different price depending on the moulding and size. Each framer works to varying timetables so we do like to book a space in their schedule for you. This means we can have the frame ready before your painting or drawing is complete. This way you wont have to wait longer than necessary for your portrait to be home with you. Our off the shelf framer can have a frame ready within 10 days, however the hand made frames can take up to 4 weeks to be completed. Our intention is to offer timeless frames to compliment our paintings and drawings so that the entire painting and frame can be passed down from generation to generation. We only work with high quality, bespoke framing companies in the UK. The frames on our pet portraits framing page are just a handful of the mouldings that our framers are able to provide. All of the mouldings below can be painted in any Farrow & Ball and Designers Guild colours. They can be in gold, silver, bronze, pewter, plus guided in gold and silver leaf. Many of the frames can be hand finished in any Farrow & Ball and Designers Guild colours. They can also be gilded in gold and silver leaf. If you are interested in this service, please let us know and we can discuss your ideas and colour choices. If you would like to have a silver or brass engraved plaque on your frame we can arrange this for you. We commission a wonderful company here in the UK who produce beautiful engraved products. The plaques are beautifully made and have a good weight to them, superior quality! You can order any amount of wording / lettering and any sized plaque to fit with your chosen frame. Our plaques are available in mirror polished stainless steel and polished brass. The example on the right for Dudley's portrait is the polished brass version and it is simply stunning. We have lots of examples of portraits with their plaques displayed in our galleries. Not all frames are suitable for plaques, however if you let us know that you are thinking about having a plaque, we can guide you in the frames that are most suitable. We can also inset plaques into mounts / matts too for the pencil drawings. If you are looking to have lots of text, we can advise as to which frames would be best for this. Why not head over to our Engraved Plaques Gallery to see more examples from previous commissions. All plaques are £59. The video below shows me, Melanie, showing a painting frame using the Hampstead frame. if you head on over to the Hampstead section you can see the frame in more detail. The video explains a little about the frame, the side and shows the back too. We hope you enjoy watching it! If you have commissioned an oil painting from us, and would like to display the painting without a frame, you can! We use a bespoke canvas maker here in the UK and they make all of our canvases bespoke. They are 25mm deep and if you let us know when ordering that you would like to display your portrait unframed, Nicholas will paint the edges of the canvas for you. This means that when you look from the side of your portrait, the paintings colours will wrap around the edge as a continuation of the portrait. This doesn’t mean to say you wont choose the frame it in the future, it just means that at this point in time, you an enjoy the painting as it is. When viewers look at one of our oil paintings or pencil drawings, we ideally want them to look at the painting or drawing first. Our aim is to draw and paint your subject and for you to look straight at their eyes and then around the artwork itself. We are hopefully looking for a good exclamation like wow..great painting or great drawing. We then want the onlooker to look at the frame, as frames are a beautiful pieces of artwork in themselves. They are there to compliment and enhance the artwork but they are also there to be admired too. so we are looking for more compliments and wows! We then want the onlooker to stand back and look at the frame and artwork as a whole...and hopefully producing more enjoyment and smiles...and wows! If you need any help choosing your frame for your portrait, just drop us a line and let us know the kind of frame styles you prefer and we can help. Email us at any time! Visit our Pet Portraits framing gallery to see some previous pet portraits commissions framed.